Over two years ago I published a post containing all papers that had arrived to my RSS feed reader in one morning. I decided to have another go at this but this time for a full day. So, here I give a list of all papers that arrived to my RSS feed reader during a single day. I started this at noon January 23rd and continued until noon January 24th of 2013 (given times are in Finnish time). No editorials, corrections, comment papers, or reply papers were included, but just the new research papers. I also excluded papers that clearly were not climate related (there were about 10 or so such papers). The list below still contains some papers which are only very vaguely related to climate. It should be noted here that these are only the papers that arrived to my RSS feed reader. I don’t have all journals in there that are publishing climate change related papers. In my feed reader I only have few ecology journals but basically all biology journals can publish climate change related papers (at least on how climate change affects species or ecosystems). I don’t have any journals that are devoted to climate or energy policy, and I only have couple of journals on mitigation/adaptation issues. I don’t have general science journals (Nature, Science, PNAS,…). Additionally almost any journal of any trade can publish an occasional climate change paper. This is just to say that below is not all climate related science that got published yesterday. 1. Intensity of Climate Variability Derived from the Satellite and MERRA Reanalysis Temperatures: AO, ENSO, and QBO – Yoo et al. 2. Near Surface atmospheric response to the Total Solar Eclipse at Dibrugarh on 22 July, 2009 – Rao et al. 3. Channel electron multiplier operated on a sounding rocket without a cryogenic vacuum pump from 120 –80 km altitude – Dickson et al. 4. Response of methane emissions from wetlands to the Last Glacial Maximum and an idealized Dansgaard–Oeschger climate event: insights from two models of different complexity – Ringeval et al. 5. Tree-ring-based reconstructions of North American glacier mass balance through the Little Ice Age — Contemporary warming transition – Malcomb & Wiles. 6. Vegetation history in central Kentucky and Tennessee (USA) during the last glacial and deglacial periods – Liu et al. 7. A model-based constraint on CO2 fertilisation – Holden et al. 8. A method to automatically determine sea level for referencing snow freeboards and computing sea ice thicknesses from NASA IceBridge airborne LIDAR – Wang et al. 9. Recovering missing pixels for Landsat ETM + SLC-off imagery using multi-temporal regression analysis and a regularization method – Zeng et al. 10. MODIS-based corn grain yield estimation model incorporating crop phenology information – Sakamoto et al. 11. Updated analyses of temperature and precipitation extreme indices since the beginning of the twentieth century: The HadEX2 dataset – Donat et al. 12. Modeling aerosols and their interactions with shallow cumuli during the 2007 CHAPS field study – Shrivastava et al. 13. Effects of atmospheric light scattering on spectroscopic observations of greenhouse gases from space. Part 2: Algorithm intercomparison in the GOSAT data processing for CO2 retrievals over TCCON sites – Oshchepkov et al. 14. Assessment of surface winds over the Atlantic, Indian and Pacific Ocean sectors of the Southern Ocean in CMIP5 models: historical bias, forcing response, and state dependence – Bracegirdle et al. 15. Global Seasonal Variations of Midday Planetary Boundary Layer Depth from CALIPSO Space-Borne LIDAR – McGrath-Spangler & Denning. 16. Atmospheric deposition of polycyclic aromatic hydrocarbons (PAHs) to a coastal site of Hong Kong, South China – Liu et al. 17. Current status and future trends of SO2 and NOx pollution during the 12th FYP period in Guiyang city of China – Tian et al. 18. Chemostratigraphy of the early Pliocene diatomite interval from MIS AND-1B core (Antarctica): Paleoenvironment implications – Scopelliti et al. 19. Blowin’ in the wind: Short-term weather and belief in anthropogenic climate change – Hamilton & Stampone. 20. The Lisbon Earthquake of 1755 and Superstorm Sandy: The Need to Understand Long-Term Impacts – Balstad. 21. Dissolved inorganic carbon and alkalinity fluxes from coastal marine sediments: model estimates for different shelf environments and sensitivity to global change – Krumins et al. 22. Prediction, time variance, and classification of hydraulic response to recharge in two karst aquifers – Long & Mahler. 23. Does Antarctic glaciation cool the world? – Goldner et al. 24. A lacustrine sedimentary record of Holocene periglacial activity from the Uinta Mountains, Utah, U.S.A. – Munroe et al. 25. Assessment of potential suspended sediment yield in Japan in the 21st century with reference to the general circulation model climate change scenarios – Mouri et al. 26. Changes in precipitation extremes on the Black Sea Western Coast – Croitoru et al. Today we are used to receiving new climate research written in English. That has not always been the case. There even was a time when English was a very minor language in science. Some time ago I started thinking that by concentrating on research written in English we might be missing lot of climate science, especially historically. I decided to take a look at the situation. There are 2,550,000 hits in the English/Latin. Non-English (excluding Latin of course) languages have 2,235,364 hits. 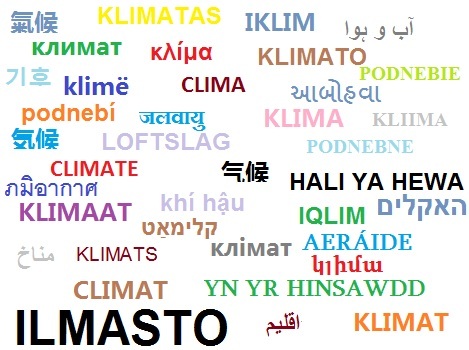 So, it seems that almost an equal number of climate papers exist in English as in non-English languages. Some languages are missing from the table because they didn’t produce any hits (and of course lot of others that are not supported by Google Scholar). Like I mentioned above, the numbers have a lot of uncertainties. Google Scholar returns a lot more search results than just peer-reviewed papers. There are books, reports, and even some blog posts. This distorts the resulting number of hits. This seems to be a substantial problem for example in the search results for my native language, Finnish. Another source of error is that Google Scholar returns search results for both author names and journal names. This is a big issue for example in German results. There seems to be lot of papers published by many authors who have the last name “Klima”. 350,000 hits for the German language therefore seems to be off by quite a lot. A search for “Klimawandel” (climate change) resulted in 21,900 hits. English “climate change” gives 1,570,000 hits, so the resulting ratio of climate/climate change = 1.62 for English. Assuming the same ratio for German, it would result in 21,900 * 1.62 = 35,600 hits for “klima” (climate). However, this feels somewhat too low considering that German is a common language in science, and that other comparable languages have many more hits (for example, French has over 318,000 hits – but see below for the need to correct French results). Also, most of Hungary’s results seem to be from author’s names. Yet another problem is that not all of the search results are in the language that was intended. This is partly due to the issue mentioned above about Google Scholar returning results both for author and journal names. There are also occasions where another language has the same word (or close enough for Google Scholar) in another meaning, or has an author’s name matching the search word. French search results, for example, includepapers in other languages. According to the first result page (yes, I know it’s not a very big sample…), French results are 20% non-French. This would reduce the number of French language hits to 254,400. Albania’s word for climate is “klimë”, but almost all search results are for “klime”, so Google Scholar sometimes gives additional results for words that are close to the actual search. Search results might also not be climate related. The word “climate” has other, non-meteorological, meanings. Such as the political climate, or a climate of fear. The possibility for this source of error might be even worse for some other languages. There are also duplicate entries for some papers. And these probably are not all error sources. Some non-English papers have also been published in English (or vice versa), so the ratio of non-English and English papers (= 0.87) might not be accurate. Additionally, some non-English papers have English abstracts. So, it seems that despite all of my search results, there are not 5 million climate papers out there. But there are a lot of them – and quite a few of them might be in a language other than the English and Finnish that I understand. It sure would be nice to be able to read all those papers when needed. This is a list of papers on the new geological epoch called the Anthropocene. The list is not complete, and will most likely be updated in the future in order to make it more thorough and more representative. The Anthropocene: is there a geomorphological case? – Brown et al. (2013) “The ‘Anthropocene’, as used to describe the interval of recent Earth history during which humans have had an ‘overwhelming’ effect on the Earth system, is now being formally considered as a possible new geological Epoch. Such a new geological time interval (possibly equivalent to the Pleistocene Epoch) requires both theoretical justification as well as empirical evidence preserved within the geological record. Since the geological record is driven by geomorphological processes, geomorphology has to be an integral part of this consideration given that it is Earth surface processes that produce terrestrial and near-shore stratigraphy. For this reason, the British Society for Geomorphology (BSG) has inaugurated a Fixed Term Working Group to consider this issue and advise the Society on how geomorphologists can engage with debates over the Anthropocene. This Commentary sets out the initial case for the formalisation of the Anthropocene and a priori considerations in the hope that it will stimulate debate amongst, and involvement by, the geomorphological community in what is a crucial issue for the discipline. The working Group is now considering the practical and aspects of such a formalisation including the relative magnitude problem, the boundary problem and the spatial diachrony of ‘anthropogenic geomorphology’.” Antony G. Brown, Stephen Tooth, Richard C. Chiverrell, Jim Rose, David S. G. Thomas, John Wainwright, Joanna E. Bullard, Varyl Thorndycraft, Rolf Aalto, Peter Downs, Earth Surface Processes and Landforms, DOI: 10.1002/esp.3368. Agro-industrial alluvium in the Swale catchment, northern England, as an event marker for the Anthropocene – Foulds et al. (2013) “Physically and chemically distinctive late-Prehistoric and historical age alluvial deposits are characteristic of many upland and lowland river systems in the UK. Despite their widespread distribution, there have been few attempts to construct robust chronologies or to identify environmental factors that governed their formation. The Swale catchment in northern England is typical in this respect, with large areas of its valley floor covered by sedimentologically distinctive laminated sands and silts, enriched in organic material and Pb, and underlain by uncontaminated and structureless silts. Using 14C dating, chemostratigraphy, lichenometry and historical maps, a catchment-wide change in sedimentation style has been dated to between the mid 18th and early 19th centuries AD. Several causative factors were responsible for this change in sedimentation style and include the initiation of large-scale, intensive lead mining from the latter half of the 18th century onwards, embankment construction in the lowlands and historical peat erosion in the uplands. Transformation of the Swale floodplain also reflects longer-term land-use and climate change. In particular, deforestation of headwater tributaries by monastic grazing practices in the High Middle Ages (AD 1000–1300) led to a period of fine-grained sedimentation in upland catchments, as well as priming hillslopes for erosion and widespread channel network incision and increased fine sediment flux during the climatic downturn of the ‘Little Ice Age’. Sediment facies of a similar nature have been widely recorded in other northern English river catchments and represent a regional land use–climate signal characteristic of the Anthropocene. We introduce the term ‘agro-industrial alluvium’ to describe these types of deposit. They have similarities to post-settlement alluvium in North America and Australia, where historical land-use change had a similar impact on valley floor sedimentology.” Simon A Foulds, Mark G Macklin, Paul A Brewer, The Holocene January 8, 2013 0959683612465445, doi: 10.1177/0959683612465445. Holocene and Anthropocene Landscape Change: Arroyo Formation on Santa Cruz Island, California – Perroy et al. (2012) “In this study, we untangle the relative importance of climatic, tectonic, and anthropogenic drivers as triggers of arroyo formation and geomorphic change for a small watershed on Santa Cruz Island, California. Within the Pozo watershed (6.47 km2), historic arroyo incision occurred contemporaneously with arroyo incision across many of the world’s dryland regions. Unlike many of these other sites, Pozo contains a datable record that allows quantification of sedimentation rates from the mid-to-late Holocene to the twentieth century. Basin-wide environmental changes were assessed using a combination of cosmogenic radionuclide inventories, midden and marine-shell deposits, relict soil properties, airborne and ground-based light detection and ranging (lidar) data, ranching artifacts, and historic records. Shortly after the introduction of sheep in 1853, localized sedimentation rates on the Pozo floodplain increased by two orders of magnitude from 0.4 mm/year to 25 mm/year. Accelerated sedimentation was followed by arroyo formation ca. 1878 and rapid expansion of the incipient gully network, the lateral extent of which has been largely maintained since 1929. Catchment-mean erosion rates from cosmogenic radionuclide measurements indicate that presettlement rates were less than 0.08 mm/year, whereas lidar-derived measurements of historic gully erosion produce estimates almost thirty times higher (2.2 mm/year). Topographic measurements since 2005 indicate that the active channel of the Pozo watershed is aggrading. We argue that accelerated sedimentation due to overgrazing, and an unusually large 1878 rainstorm event, set the stage for arroyo formation in the Pozo watershed between 1875 and 1886. We hypothesize that even in the absence of modern human disturbance, downcutting would have occurred due to intrinsic hillslope stability thresholds.” Ryan L. Perroy, Bodo Bookhagen, Oliver A. Chadwick & Jeffrey T. Howarth, Annals of the Association of American Geographers, Volume 102, Issue 6, 2012, DOI:10.1080/00045608.2012.715054. Cause of the chalcophile trace element enrichments marking the Holocene to Anthropocene transition in northern Chesapeake Bay sediments – Dolor et al. (2012) “In Chesapeake Bay sediments, concentrations of 15 chalcophile trace elements, half rarely determined in estuaries, display historical profiles having remarkably similar features. All element concentrations rose more or less simultaneously in the 1920–1940 interval, creating a chemostratigraphic marker of the Holocene to Anthropocene transition. Subsequently, concentration maxima occurred at ∼20-year intervals, suggesting a link to a documented climate cycle of similar period. These elements’ correlated profiles suggest that sediments approximate binary mixtures of one lithogenic and one multi-element anthropogenic component. The latter component is characterized by these mass ratios (±standard error): [View Within Article]. Where comparisons are possible, these ratios differ from those of contaminants in the harbor of the region’s principal industrial city, Baltimore, but are surprisingly similar to those in sediment contaminants from the Susquehanna River, the Bay’s chief tributary. Thus both the anthropogenic and the lithogenic components in the Bay’s central channel appear to originate in the river basin. Many chalcophile element ratios in the anthropogenic component are similar to those in regional aerosols. If cumulative aerosol deposition on soils in the river basin is the source of the anthropogenic component, then the above ratios could be a regional anthropogenic signature that should be looked for more widely. Unlike Mo, the enrichment of these chalcophile elements in the Bay’s sediments is not controlled by seasonal anoxia; Mo apparently possesses a unique capacity to record past redox information about estuaries owing to its high seawater concentration.” Marvourneen K. Dolor, George R. Helz, William F. McDonough, Geochimica et Cosmochimica Acta, Volume 82, 1 April 2012, Pages 79–91, http://dx.doi.org/10.1016/j.gca.2010.06.040. The Anthropocene: Are Humans Now Overwhelming the Great Forces of Nature – Steffen et al. (2007) “We explore the development of the Anthropocene, the current epoch in which humans and our societies have become a global geophysical force. The Anthropocene began around 1800 with the onset of industrialization, the central feature of which was the enormous expansion in the use of fossil fuels. We use atmospheric carbon dioxide concentration as a single, simple indicator to track the progression of the Anthropocene. From a preindustrial value of 270–275 ppm, atmospheric carbon dioxide had risen to about 310 ppm by 1950. Since then the human enterprise has experienced a remarkable explosion, the Great Acceleration, with significant consequences for Earth System functioning. Atmospheric CO2 concentration has risen from 310 to 380 ppm since 1950, with about half of the total rise since the preindustrial era occurring in just the last 30 years. The Great Acceleration is reaching criticality. Whatever unfolds, the next few decades will surely be a tipping point in the evolution of the Anthropocene.” Will Steffen, Paul J. Crutzen, John R. McNeill, AMBIO: A Journal of the Human Environment 36(8):614-621. 2007, doi: http://dx.doi.org/10.1579/0044-7447(2007)36%5B614:TAAHNO%5D2.0.CO;2. Fluvial filtering of land-to-ocean fluxes: from natural Holocene variations to Anthropocene – Meybeck & Vörösmarty (2005) “The evolution of river systems and their related fluxes is considered at various time scales: (i) over the last 18 000 years, under climatic variability control, (ii) over the last 50 to 200 years (Anthropocene) due to direct human impacts. Natural Holocene variations in time and space depend on (i) land-to-ocean connections (endorheism, glacial cover, exposure of continental shelf); (ii) types of natural fluvial filters (e.g., wetlands, lakes, floodplains, estuaries). Anthropocene changes concern (i) land–ocean connection (e.g., partial to total runoff reduction resulting from water management), (ii) modification and removal of natural filters, (iii) creation of new filters, particularly irrigated fields and reservoirs, (iv) acceleration and/or development of material sources from human activities. The total river basin area directly affected by human activities is of the same order of magnitude (>40 Mkm2) as the total area affected over the last 18 000 years. A tentative analysis of 38 major river systems totaling 55 Mkm2 is proposed for several criteria: (i) trajectories of Holocene evolution, (ii) occurrence of natural fluvial filters, (iii) present-day fluvial filters: most river basins are unique. Riverine fluxes per unit area are characterized by hot spots that exceed the world average by one order of magnitude. At the Anthropocene (i.e., since 1950), many riverine fluxes have globally increased (sodium, chloride, sulfate, nitrogen, phosphorous, heavy metals), others are stable (calcium, bicarbonate, sediments) or likely to decrease (dissolved silica). Future trajectories of river fluxes will depend on the balance between increased sources of material (e.g., soil erosion, pollution, fertilization), water abstraction for irrigation and the modification of fluvial filters, particularly the occurrence of reservoirs that already intercept half of the water and store at least 30% of river sediment fluxes. In some river systems, retention actually exceeds material production and river fluxes are actually decreasing. These trajectories are specific to each river and to each type of river material. Megacities, mining and industrial districts can be considered as hot spots of contaminants fluxes, while major reservoirs are global-scale sinks for all particulates. Global picture should therefore be determined at a fine resolution, since regional differences in Anthropocene evolution of river fluxes may reach one order of magnitude, as illustrated for total nitrogen.” Michel Meybeck, Charles Vörösmarty, Comptes Rendus Geoscience, Volume 337, Issues 1–2, January–February 2005, Pages 107–123, http://dx.doi.org/10.1016/j.crte.2004.09.016. L’éxigence idéaliste et le fait de l’évolution – Le Roy (1927) A book where term “Noosphere” is used for Anthropocene. E. W. Berry, Science, New Series, Vol. 64, No. 1644 (Jul. 2, 1926), p. 16, DOI: 10.2307/1651728. The Term Psychozoic – Berry (1926) No abstract. E. W. Berry, Science, New Series, Vol. 64, No. 1644 (Jul. 2, 1926), p. 16, DOI: 10.2307/1651728. Corsa di Geologia – Stoppani (1873) A book where term “anthropozoic” is used for Anthropocene. From Crutzen (2002): “Mankind’s growing influence on the environment was recognized as long ago as 1873, when the Italian geologist Antonio Stoppani spoke about a “new telluric force which in power and universality may be compared to the greater forces of earth,” referring to the “anthropozoic era”.” Stoppani, A. Corsa di Geologia; Milan, 1873. This list contains papers that on Sun’s role in the recent climate change. The list is not complete, and will most likely be updated in the future in order to make it more thorough and more representative. Generally no papers simply reporting solar activity measurements are included (those papers will get their own list in future) or other solar activity related papers that do not discuss recent climate change. Also indirect solar effects are mainly left to their own lists (for example through geomagnetism). There already are separate lists for solar cycle length and cosmic rays. UPDATE (September 3, 2013): Wang & Dickinson (2013) added. Thanks to JesusR for pointing it out. Solar activity–climate relations: A different approach – Stauning (2011) “The presentation of solar activity–climate relations is extended with the most recent sunspot and global temperature data series. The extension of data series shows clearly that the changes in terrestrial temperatures are related to sources different from solar activity after ∼1985. Based on analyses of data series for the years 1850–1985 it is demonstrated that, apart from an interval of positive deviation followed by a similar negative excursion in Earth’s temperatures between ∼1923 and 1965, there is a strong correlation between solar activity and terrestrial temperatures delayed by 3 years, which complies with basic causality principles. A regression analysis between solar activity represented by the cycle-average sunspot number, SSNA, and global temperature anomalies, ΔTA, averaged over the same interval lengths, but delayed by 3 years, provides the relation ΔTA∼0.009 (±0.002) SSNA. Since the largest ever observed SSNA is ∼90 (in 1954–1965), the solar activity-related changes in global temperatures could amount to no more than ±0.4 °C over the past ∼400 years where the sunspots have been recorded. It is demonstrated that the small amplitudes of cyclic variations in the average global temperatures over the ∼11 year solar cycle excludes many of the various driver processes suggested in published and frequently quoted solar activity–climate relations. It is suggested that the in-cycle variations and also the longer term variations in global temperatures over the examined 135 years are mainly caused by corresponding changes in the total solar irradiance level representing the energy output from the core, but further modulated by varying energy transmission properties in the active outer regions of the Sun.” P. Stauning, Journal of Atmospheric and Solar-Terrestrial Physics, Volume 73, Issue 13, August 2011, Pages 1999–2012, http://dx.doi.org/10.1016/j.jastp.2011.06.011. How unusual is today’s solar activity? (reply) – Solanki et al. (2005) “Muscheler et al. claim that the solar activity affecting cosmic rays was much higher in the past than we deduced from 14C measurements. However, this claim is based on a problematic normalization and is in conflict with independent results, such as the 44Ti activity in meteorites and the 10Be concentration in ice cores.” S. K. Solanki, I. G. Usoskin, B. Kromer, M. Schüssler & J. Beer, Nature 436, E4-E5 (28 July 2005) | doi:10.1038/nature04046. How unusual is today’s solar activity? – Muscheler et al. (2005) “To put global warming into context requires knowledge about past changes in solar activity and the role of the Sun in climate change. Solanki et al. propose that solar activity during recent decades was exceptionally high compared with that over the preceding 8,000 years. However, our extended analysis of the radiocarbon record reveals several periods during past centuries in which the strength of the magnetic field in the solar wind was similar to, or even higher than, that of today.” Raimund Muscheler, Fortunat Joos, Simon A. Müller & Ian Snowball, Nature 436, E3-E4 (28 July 2005) | doi:10.1038/nature04045. Unusual activity of the Sun during recent decades compared to the previous 11,000 years – Solanki et al. (2004) “Direct observations of sunspot numbers are available for the past four centuries, but longer time series are required, for example, for the identification of a possible solar influence on climate and for testing models of the solar dynamo. Here we report a reconstruction of the sunspot number covering the past 11,400 years, based on dendrochronologically dated radiocarbon concentrations. We combine physics-based models for each of the processes connecting the radiocarbon concentration with sunspot number. According to our reconstruction, the level of solar activity during the past 70 years is exceptional, and the previous period of equally high activity occurred more than 8,000 years ago. We find that during the past 11,400 years the Sun spent only of the order of 10% of the time at a similarly high level of magnetic activity and almost all of the earlier high-activity periods were shorter than the present episode. Although the rarity of the current episode of high average sunspot numbers may indicate that the Sun has contributed to the unusual climate change during the twentieth century, we point out that solar variability is unlikely to have been the dominant cause of the strong warming during the past three decades.” S. K. Solanki, I. G. Usoskin, B. Kromer, M. Schüssler & J. Beer, Nature 431, 1084-1087 (28 October 2004) | doi:10.1038/nature02995. Solar Variability and the Earth’s Climate: Introduction and Overview – Reid (2000) “Numerous attempts have been made over the years to link various aspects of solar variability to changes in the Earth’s climate. There has been growing interest in this possible connection in recent years, spurred largely by the need to understand the natural causes of climate change, against which the expected global warming due to man’s activities will have to be detected. The time scale of concern here is that of decades to centuries, and excludes the longer millennial scale in which orbital variations play a dominant role. The field has long been plagued by the lack of an acceptable physical mechanism by which solar variability can affect climate, but the discovery of variability in the Sun’s total irradiance (the solar “constant” of meteorology) by spacecraft instruments has pointed to a direct mechanism. Other less direct mechanisms that have been suggested involve variations in the Sun’s ultraviolet flux and in the plasma outflow of the solar wind. The purpose of this paper is to summarize the current state of the field, emphasizing the proposed mechanisms as an introduction to the more detailed papers that follow. The particular case of sea-surface temperature data will be used as an illustration.” George C. Reid, Space Science Reviews, November 2000, Volume 94, Issue 1-2, pp 1-11, DOI: 10.1023/A:1026797127105. The Seasons, Global Temperature, and Precession – Thomson (1995) “Analysis of instrumental temperature records beginning in 1659 shows that in much of the world the dominant frequency of the seasons is one cycle per anomalistic year (the time from perihelion to perihelion, 365.25964 days), not one cycle per tropical year (the time from equinox to equinox, 365.24220 days), and that the timing of the annual temperature cycle is controlled by perihelion. The assumption that the seasons were timed by the equinoxes has caused many statistical analyses of climate data to be badly biased. Coherence between changes in the amplitude of the annual cycle and those in the average temperature show that between 1854 and 1922 there were small temperature variations, probably of solar origin. Since 1922, the phase of the Northern Hemisphere coherence between these quantities switched from 0° to 180° and implies that solar variability cannot be the sole cause of the increasing temperature over the last century. About 1940, the phase patterns of the previous 300 years began to change and now appear to be changing at an unprecedented rate. The average change in phase is now coherent with the logarithm of atmospheric CO2 concentration.” David J. Thomson, Science 7 April 1995: Vol. 268 no. 5207 pp. 59-68, DOI: 10.1126/science.268.5207.59.